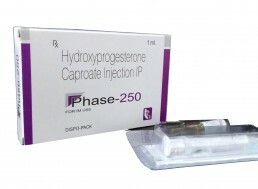 Trumac Healthcare is one of leading Hydroxyprogesterone Caproate Injections Manufacturers Suppliers in India. Third Party Contract Manufacturing available. 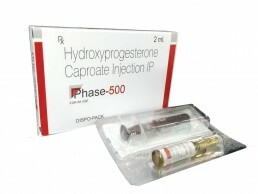 Trumac Healthcare is one of the leading Hydroxyprogesterone Caproate Injections Manufacturers Suppliers all over India. WHO:GMP Certified Third Party Contract Manufacturing also available. Hydroxyprogesterone is used in premature labor. Hydroxyprogesterone is a progestin (female hormone). It works by modulating the immune response of the mother to prevent rejection of the embryo and allow its attachment to the uterus. This prevents miscarriage and helps lower the risk of premature birth in women who have had one premature delivery in the past.